Manila Water Foundation’s special block screening of Finding Dory was a sure hit. All the attendees had fun with the help of the event’s generous sponsors. Platinum sponsor Freewaters gave 30% discount coupons to all attendees while products from Rebisco and Nestle filled the loot bags that were distributed after. Manila Ocean Park, EDSA Shangri-La Manila, The Picture Company, and California Pizza Kitchen provided raffle prizes. 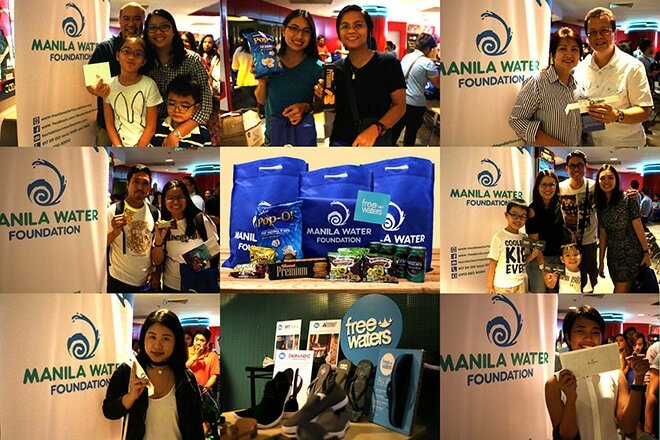 Some 300 individuals helped raise funds for the provision of water to communities severely affected by El Niño and other natural disasters through Manila Water Foundation’s special block screening of the movie, Finding Dory, held on June 18, 2016 at the Shang Cineplex, Shangri-La Plaza. APSB is one of Manila Water Foundation’s flagship programs under its Water Supply and Sanitation focus area, which aims to bring safe and potable water to displaced and calamity-stricken communities to address the pressing need for drinking water until such time that a sense of normalcy has been restored. The special block screening got people to contribute to the fulfillment of APSB’s mandate and have a pleasurable time watching a much-anticipated movie with their families and loved ones. One of the attendees, Margret Concepcion, expressed how she readily agreed to be a part of the event that allowed her to spend quality time with her son and help others at the same time. “My son really wanted to see the movie since it was advertised. It was really our plan to watch it so when I was invited, I immediately said yes. When we found out that the proceeds will go to calamity victims, we became more excited,” she said. Aside from the movie, different pre-screening activities were prepared to make the event more memorable. Kids and kids at heart enjoyed the face painting, photo booth and coloring stations while waiting for the movie to start. Afterwards, loot bags containing goodies from Nestle and Rebisco were distributed. A discount coupon from Freewaters was also given to each attendee prior to the event. Several viewers were also able to bring home prizes also courtesy of the sponsors through a raffle draw. Some of the prizes for lucky attendees included gift certificates from EDSA Shangri-La Manila and California Pizza Kitchen. Several vouchers for free photo sessions with The Picture Company and complimentary Deep Sea Rush tickets from the Manila Ocean Park were also given away to the raffle winners. This gathering of people to help fellows in need is a proof that the Filipino spirit of malasakit is alive and is a moment definitely worth remembering. Hopefully, moments like this will help shape the way people do things not only for their good but also for the planet and people in need. Event photos and photo booth prints can be seen on our Facebook page. Please click links below to view them. The men and women of Manila Water Foundation were all smiles after the successful event that helped raise funds for communities severely affected by El Niño and other natural disasters. Please play the video to see the highlights of the event.